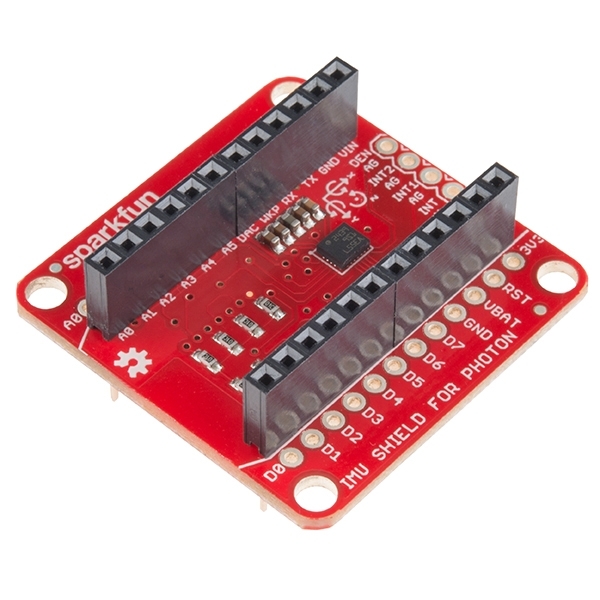 This is the SparkFun Photon IMU Shield, a versatile motion-sensing add-on board for your Photon device with an on-board LSM9DS1 system-in-a-chip that houses a 3-axis accelerometer, 3-axis gyroscope, and 3-axis magnetometer. That’s right, 9 degrees of freedom (9DOF) from a single IC! Each sensor in the LSM9DS1 supports a large variety of ranges: the accelerometer’s scale can be set to ± 2, 4, 6, 8, or 16 g, the gyroscope supports ± 245, 500, and 2000 °/s, and the magnetometer has full-scale ranges of ± 2, 4, 8, or 12 gauss. The SparkFun Photon IMU Shield comes with the headers already soldered on, so you can plug and play!